Born in Luss, on 20 May, 1822, Thomas Gildard was apprenticed to David and James Hamilton , in December 1838, and throughout his five years in their office he trained beside J T Rochead and Charles Wilson . In 1853, he formed a partnership with his brother-in-law, Robert H M Macfarlane (d. 1862) at 160 Hope Street. After Macfarlane's death in 1862, Gildard practiced on his own until 1869, when he joined the City Architect's office, working under John Carrick and his successor, A B McDonald. One of Gildard's important commissions in the mid-1860s was for the plans of Dumbarton Burgh Hall (1864, unexecuted). Architecturally, Gildard & Macfarlane designed little of interest other than the domestic, 1-8 Belgrave Terrace, Great Western Road (1856) and the Britannia Music Hall, Trongate (1857), for which they have since become stars of the city's cultural heritage through having designed the oldest surviving music hall in Britain, and through the building's celebrated role in the early careers of Stan Laurel and Cary Grant. Sculpturally, the Britannia, which probably took its name from John Crawford 's statue of Britannia on the nearby John McIntyre's Corner at Glasgow Cross (lost, c. 1949), is of importance due to the fact that its facade was originally adorned with four pairs of cherubs holding shields, which were lost at some point during the building's many changes of owner and use. Gildard also had literary interests and regularly contributed to the Weekly Citizen and several trade journals. 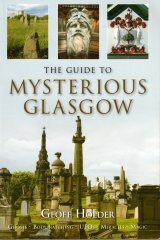 He is remembered mainly for his reminiscences of Glasgow's architectural scene in the early 1800s, which were serialised in The Builder's Journal, in 1895 (he was their Glasgow correspondent). These are an invaluable source of details about the city's architectural development and contain fascinating and intimate portraits of major architects of the day and their mentors and pupils. The lives and work of the Mossman family of sculptors are particularly illuminated in his accounts of their meetings and his familiarity with their projects. A popular figure, he was nicknamed Buffalo Bill by his colleagues at the Builder's Journal (due to his resemblance to the famous showman) and was widely mourned after his death on 5th December, 1895. 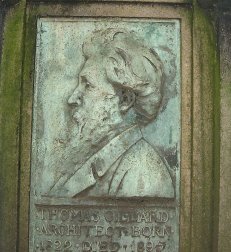 Gildard was buried in the Necropolis, and his monument, designed by his nephew, R J Gildard, of Perth (stonework by J & G Mossman ), was unveiled in a solemn ceremony on the first anniversary of his death. This now lies broken and in pieces, although its bronze portrait panel (executed and gifted by William Shirreffs ) is intact. 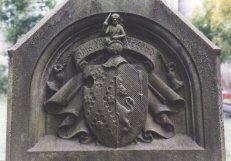 Macfarlane, about whom very little is known, lies in Glasgow Cathedral's New Burial Ground, the monument carved with his coat of arms (motto: This I'll Defend).